Hey there, crypto fans! All anyone seems to be talking about is cryptocurrency, right? It’s more popular than Pokémon! There are so many different kinds to choose from. In total, there are currently over 1,500 different cryptocurrencies! There also seems to be a million different places to buy and sell cryptocurrencies. These places are called exchanges. It can be really difficult to know where to start. One popular place to trade cryptocurrency is Bittrex. But is it any good though? I think we need a Bittrex review. There might be other Bittrex reviews out there, but you’ll only need this one. This Bittrex review will not only tell you what Bittrex is, but it will also tell you how to use it. By the time you finish reading you’ll know whether Bittrex is the crypto exchange for you. 3 What’s good about Bittrex? 4 What’s bad about Bittrex? 7 Who should use Bittrex? Cryptocurrency is still wild. You can make money fast, but you can also lose everything. Coincheck, a Japanese crypto exchange was hacked in January 2018. It lost 530 million coins. In South Korea, another exchange called Youbit had to stop trading after hackers stole 17% of its currency. Putting your money into crypto exchanges can be very risky. This is where Bittrex comes in. Bittrex believes that, for cryptocurrencies to reach their full global potential, people need to be able to trust them. Bittrex knows that crazy cowboys will go West whether it’s safe or not. What Bittrex wants is for us all to get involved. Bittrex was founded by Bill Shihara, Richie Lai, Rami Kawach and Ryan Hentz in 2014. It’s based in Seattle, Washington. The team have more than 50 years of experience in security and development for companies like Microsoft, Amazon, Qualys and Blackberry. So, if this is the Wild West then Bittrex is the Sheriff! Security is key for Bittrex. Bill Shihara and the gang saw other platforms being hacked. 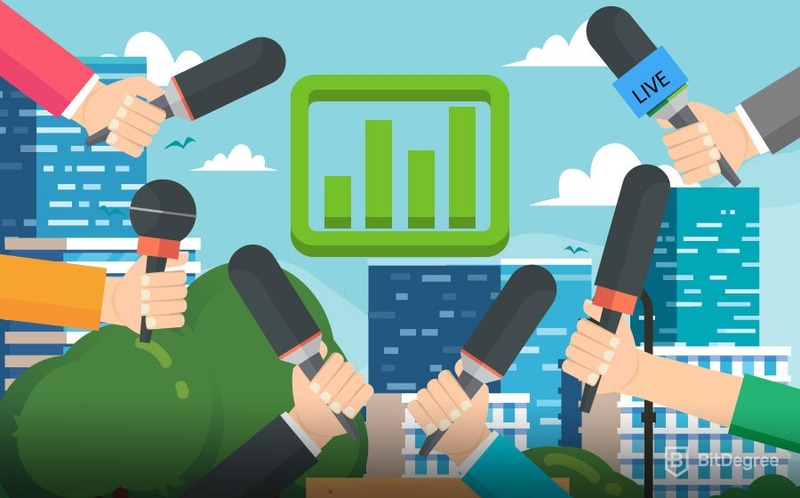 They decided to use their skills to build a platform that investors could trust. Bittrex is a crypto-to-crypto trading exchange. On a crypto-to-crypto trading exchange, you can only trade in cryptocurrencies. This means you can’t buy cryptocurrencies with fiat currencies. Note: A fiat currency is any currency that is supported by a government. Examples of fiat currencies are the US Dollar, the British Pound and the Chinese Yuan. However, you can invest using USDT. US Dollar Tether is a cryptocurrency whose value is tied or tethered to the value of the US Dollar, so 1USDT is always worth 1USD. The more popular cryptocurrencies, like Bitcoin and Tether, have the most available trading pairs. Bitcoin alone has more than 450 trading pairs on Bittrex. Fees: Bittrex charges a flat rate of 0.25% on every trade. This is a little higher than the average but makes things a lot simpler for newbies. Having one fee for all transactions makes remembering what you’ve spent much easier. Variety: Bittrex has a great choice of cryptocurrencies (>190). This allows users to trade with older well-known coins as well as newer ones like Loopring and Tron. Every day, Bittrex reviews which currencies it lists. It adds exciting new coins as often as it can. By comparison, Poloniex only has around 80 cryptocurrencies to trade. Verification: This is the process by which an exchange checks who you are before you’re allowed to start trading. Bittrex aims to take as little user information as possible while keeping the platform safe from harm.It does this using a service called Jumio, which checks local records. Jumio can verify over 100 million people in over 200 countries. This means that you only have to give your name, address and date of birth. It also means that traders from all over the world can use the exchange. Speed: Bittrex was built using elastic computing. This means the platform can process trades as soon as they happen. Note: Elastic computing means that the system is designed to deal with increased workloads — Bittrex is a fast service, even when it’s busy. Fiat trading: Bittrex doesn’t allow users to trade using fiat currencies, yet. In a recent podcast, Bill Shihara said that users will be allowed to trade in US Dollars soon. Until that happens, users must own Bitcoin, Tether or Ethereum before they start trading. Other exchanges like Coinbase and Kraken allow users to buy cryptocurrency with fiat currencies. Accessibility: Bittrex prides itself on being a secure platform but this has a downside. It seems that Bittrex might be too secure! Some users have been locked out of their own accounts. This problem has been blamed on the way Bittrex verifies its users. Bittrex is now working on the balance it has between security and easy user access. Customer service: Some users are unhappy with the way the platform deals with complaints. Some users have waited weeks for a response. Bittrex has said sorry for how long it took to fix the problems it was having with verification. A group of investors, called Group A, pick a cheap coin. They buy lots of it. Let’s imagine this coin is called ‘Cheapcoin’. The price of Cheapcoin goes up. Other investors, called Group B, see that the price of Cheapcoin is going up, so they buy some too. Now that the price of Cheapcoin is high, Group A sells all of its Cheapcoin. The price of Cheapcoin goes back down. Group B are left with a coin that they can only sell for less than they paid for it.This type of scam can happen on any platform. 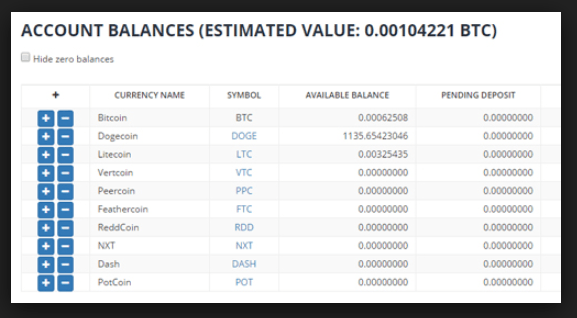 Bittrex must be very careful when choosing which coins to list so that this doesn’t happen too often. When people read a Bittrex exchange review and they see that it has a few issues they ask themselves, is Bittrex safe? To answer that question, this Bittrex review will look at Bittrex’s security a bit more closely. Bittrex is the most secure cryptocurrency exchange in the market. Its team are all experts in the area. In the system Bittrex uses, 80-90% of all currency is kept offline. This is called cold storage. So far, Bittrex hasn’t been hacked or lost any of its customers money. 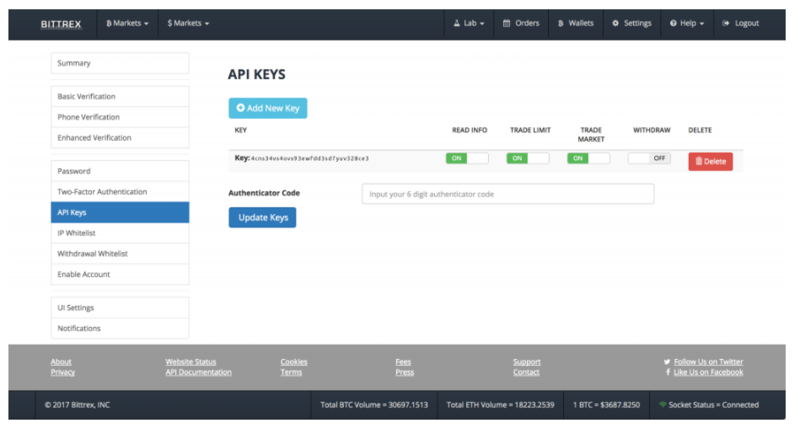 Bittrex also uses two-factor authentication for all of its transactions. Note: Two-factor authentication is where a user has to provide two kinds of information before a transaction can take place. The first kind is usually a password and the second is a code that is sent to the user’s mobile phone. As it is based in Seattle, Bittrex follows American law very closely. It follows the Anti-Money Laundering and the Know Your Customer programs set up by the US Government. These programs are designed to stop fraud and other financial crimes. Most of the issues users have with the platform come from it’s tough security protocols. Some users even think that Bittrex uses verification issues as an excuse to lock user accounts and take their currency! What do you think? Is Bittrex legit? 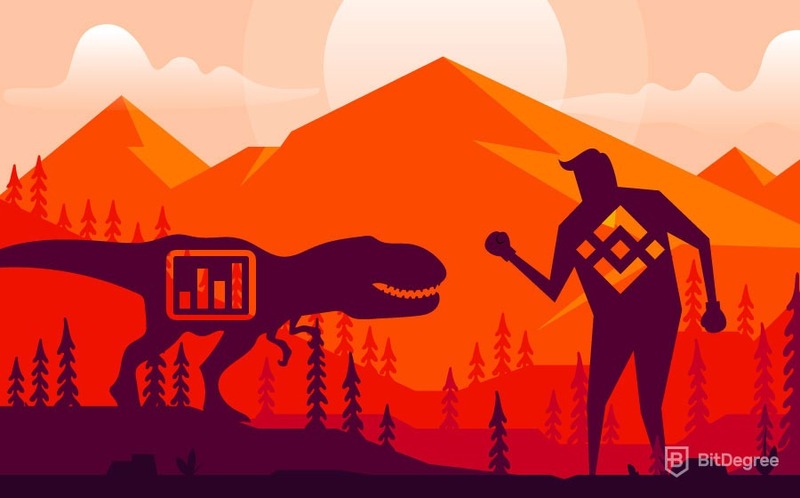 Bittrex is about as far away from the Wild West of cryptocurrency as it’s possible to be! Bittrex works very hard to keep its platform safe. As I mentioned earlier, it’s all about finding the right balance. Bittrex is very legit. It just needs a little work on user access and dealing with feedback faster. This Bittrex review has covered what Bittrex is, what’s good and not so good about it. Now I will show you how to trade on Bittrex. Getting started is simple. 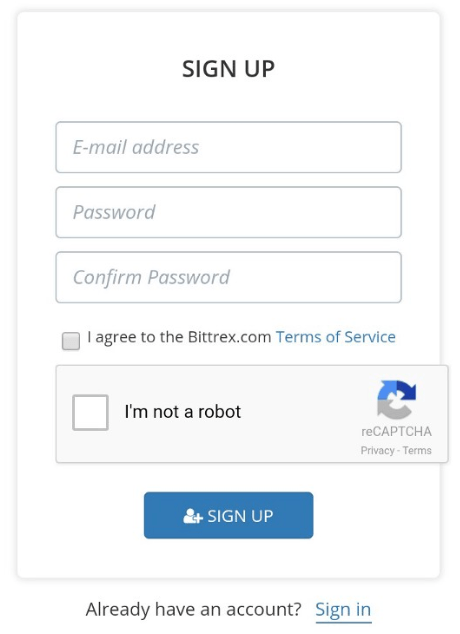 Go to the Bittrex homepage and click on LOG IN and then SIGN UP. You’ll be asked to enter your email address and choose a password. Make sure it’s a good one! Now, you’ll be sent an email. So, click on the link in the email to verify your email address. Next go to SETTINGS and click on BASIC VERIFICATION. You’ll be asked to enter your phone number, Bittrex will use Jumio to verify it. To turn on two-factor authentication, go to SETTINGS then TWO-FACTOR AUTHENTICATION. Once it’s turned on Bittrex will use Google Authenticator to send you a number. Enter the number and your account will be ready to use. Quick Tip: If you don’t have Google Authenticator then you can download it here. As I said earlier, you’ll need some cryptocurrency before you start using Bittrex. You’ll need to open an account at an exchange like Coinbase. Here, you can buy cryptocurrency with the fiat currency of your choice. Now that you’ve got some coins, you can send them to Bittrex and start trading with it. To do this, you need to log in to your Bittrex account. Now click on WALLETS then choose the coins you want to send. Here, we’re using Bitcoin as an example. Click on the ‘+’ icon. 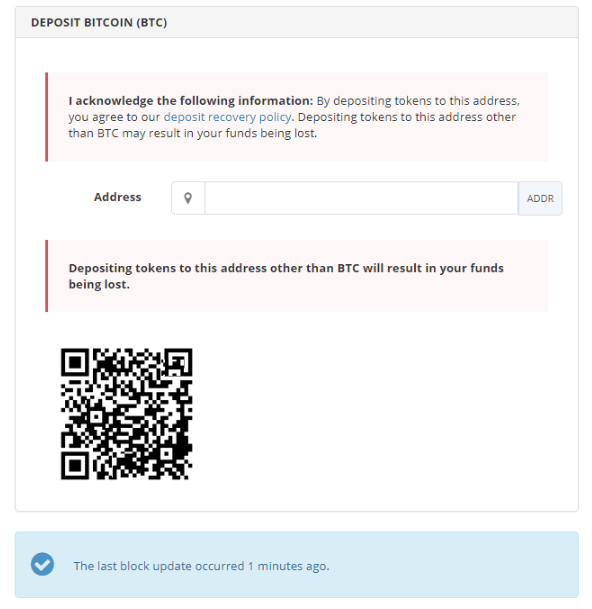 A message will read DEPOSIT BITCOIN and you will be sent a link to your Bittrex address. You will now be able to send Bitcoin from your Coinbase account to your Bittrex address and start making trades. Note: Wallets and addresses can be really confusing! Addresses are like your email address. You can tell people what your address is and they can send things to it. To get into your emails you need a password. In crypto, these passwords are called private keys and they are kept safe in wallets. So, addresses are public (anyone can see them) and wallets are private (only you can see them). Before you make your first trade, you need to change a few settings so that Bittrex is legally allowed to help you trade. To do this, go to API KEYS and turn everything to ON except WITHDRAW. Have a look at the picture below to see what I mean. Now, go to CONFIG and select Bittrex as your exchange. I hope you’re still awake, because you’re ready to start trading! Select MARKETS choose the currency you want to trade. We’ll use Ark as our example. You can check what price Ark is being sold for in the ORDER BOOK. Now you can choose the amount you want and make a bid by clicking BUY ARK. When your bid is accepted your new currency will be sent to your Bittrex wallet. When you’ve been trading for a while your wallet will look something like this. Quick Tip: When storing cryptocurrencies it is always best to use more than one wallet. You should keep most of your currency stored offline in hardware or paper wallets. When you’ve made a ton of money trading crypto, you might want to take some of it out. To do this, click on the ‘-’ icon on your account screen and enter the address where you want to send currency. For example, you could use your Coinbase address or another external wallet. Simple! No Bittrex review would be complete without a few recommendations. Is Bittrex for you? Bittrex’s creators want everybody to use their platform. They want it to have mainstream appeal. This means that they want your Grandma to be able to use it! Seriously though, Bittrex is user-friendly. They make it very easy for beginners to use the platform. However, I can’t recommend Bittrex as a users’ first exchange because it doesn’t currently allow fiat trading. Bittrex is great, but only after you’ve done some trading on another exchange. Newbie traders might also find the amount of coins on Bittrex confusing. When there are hundreds to choose from it’s easy to pick the wrong one. For beginners, it’s easier to start by trading with well-known coins. Expert traders will be better at deciding which new coins are good investments. Bittrex has had some problems with customer service. If you’re new to trading and you have an issue, you might not get the help you need from the Bittrex team. Although, like I said, they’re working on it. Probably the most important thing to a new crypto trader is security. The fact that the guys behind Bittrex have done security for Microsoft and Amazon will please a lot of potential customers. I’ll finish this Bittrex review with a final score and some final thoughts. Overall, Bittrex is a safe and easy-to-use exchange with a great choice of coins. Now that you know how to use it, are you ready to give Bittrex a try? I’d love to hear what you think! Why not write your own Bittrex review and send it over? Final Note: Bittrex is closed to new users and is only available to corporate or selected invitees. This is due to very high demand for its services. Unfortunately, no date has been set for when it will reopen, so you’ll need to keep checking. Why invest or trade in Bittrex when you can presently do the same thing with flat currency? Bittrex vs Poloniex: What’s The Better Alternative? GDAX vs Coinbase: What’s the Better Alternative?